There are three objectives in launching a new brand: Awareness, Trial and Availability.Often the "Trial and Awareness" is generated an by innovative sampling technique. So it was with interest that some friends of mine saw the Trident Layers Brink's Truck in lower Manhattan on Monday. Being interested marketers they went over to see the nicely decked out vehicle and see what the trial experience was all about. 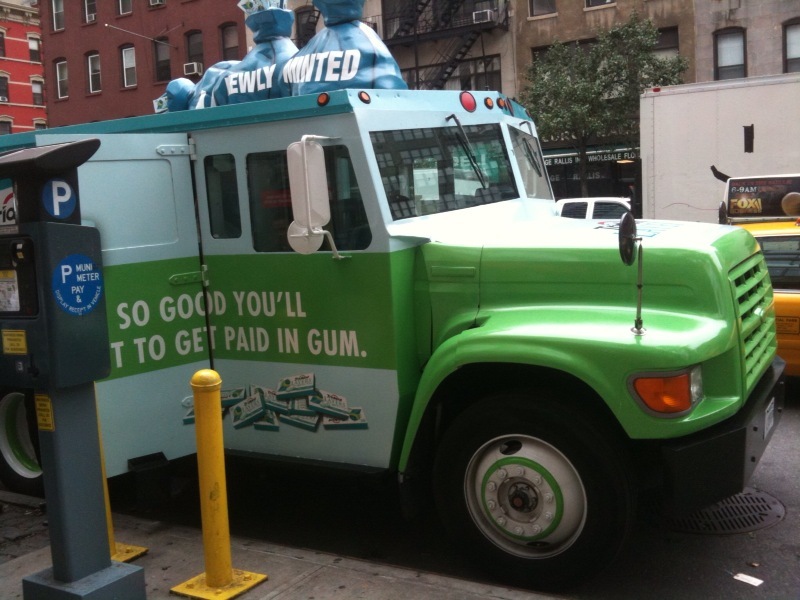 With the campaign around "So good you will want to be paid in gum" the Brink's truck appeared to be a cute idea, with he staff sampling dressed as security guards. Then the strangeness happened. They were given an scratch off instant win game card - with Four Potential prizes. $50, $25 or $10 in cash - or free gum. This is, of course a sampling technique, so my friends were expecting at minimum a free sample of new Trident Layers. After six "not a winner" cards it became apparent that the only way to try the gum would be to go to the local Duane Reade and buy some Layers. Read the small print on the game card and only 1 in 12 won free gum. The objective of this event is to sample the product: Surely if you have anyone walk away without the product you have missed your chance for Trial, you may have frustrated a potential consumer. Come on Kraft, it's chewing gum. It has massive margins. Why would you go to all the trouble of dressing a Brink's truck and providing game cards (which were probably as expensive as a pack of gum) and NOT give the intrigued consumer a gum sample? Did the sampling budget run out of money? Was the Marketing Director asleep at the switch? Or is this just a marketing department over-thinking everything? Alan and Ted walked away thinking "F*** Trident Layers, I'm buying Wrigley". SAB Miller creates brewery on a tanker... for those "just in case" scenarios. One of the great joys of being in strategy is playing "what if...". Normally we speculate about sugar taxes, M&As, ingredient shortages. But occasionally you get asked about that time horizon greater than 5 years out when imaginations can run wild. Apparently SAB Miller just had that exercise, and created their own "beyond thunderdome" scenario where global weather has become so unpredictable, and water/energy are in such short supply that man returns to a more nomadic existence -relying on the sea for much of its subsistence. Therefore SAB imagined this brewery on a tanker concept that could be used to provide beer for those survivors. And you would have to guess that if we really face such nightmare scenarios, we will need a beer to relax with! (If anyone has an actual copy of this study to share, I would love to read it - send to neilgkimberley@gmail.com). Coffee Drinkers Dying Out - Or Consumption Patterns Changing? Mintel has been analyzing coffee and seeing precisely these trends.Older consumers still drink their coffee as a daily routine. Younger consumers drink less at home and not everyday. In fact just 27% of 18-24 year olds say they are drinking coffee on a daily basis. In other analysis, it is apparent that the dollars spent on coffee is holding/increasing as Starbucks (single serve away from home consumption) and K Cups (single serve at home consumption) have made carafe coffee consumption (at home multiserve) less frequent. Changes that will be margin enhancing, but not scale producing. This is a new model for coffee, one that has take root over the past decade. Coffee has gone from the all purpose caffeine delivery system to a relaxing personal beverage occasion. With, I would believe, more changes to come. Will The Future Be Quite So Bubbly? The past year has been dominated by concerns about the impact on obesity of Carbonated Soft Drinks. Whether it has resulted in renewed calls for social engineering through a soda tax, or availability bans (most recent of these has been Boston's Municipal Buildings), the press coverage has been negative. One bright spot has been the impact of the Pepsi Refresh Everything project. The project is visibly and creatively changing the discussion about Pepsi in a positive direction. Refresh Everything started as a social media experiment and has become the marketer's dream combining relevance, interactivity and a positive message that reflects well on the brand. In contrast the big movie and sports tie-ins found on other CSD brands this summer feel empty and self-centered. Over the length of the recession the big CSD businesses have delivered big profits despite the carnage around them as consumers have returned to their value offerings. The big question that has highly paid executives up late is whether these trends will continue to drink them as the economy improves? My observation is that the old way of marketing CSDs is becoming irrelevant as their level of commoditization increases. Finding a way to drive relevance - like Refresh Everything - will be essential to giving the category a chance as consumers seek more healthy and functional alternatives. So, early on Saturday morning KO took over CCE in North America to align most of the big North American beverage businesses. As with both Pepsi and Dr Pepper Snapple the fanfare will be overshadowed inside Coke by the talks of duplication and synergy. In real terms for the employees this change will mean relocation and lost jobs for many employees. It will be a trying time, and efficiencies will be made. Wall Street will applaud. But we are now left with three behemoth beverage businesses, with massive challenges regarding what portfolio they sell, and the degree of autonomy that can be left to the marketing manager, branch manager, route salesman and merchandiser. It remains to be seen whether such centralization can be successful, or whether it creates more opportunities for the small, nimble innovative companies.